The official Canon USA store is running a refurbished DSLR (mostly) sale featuring 26 different kits. Since these sell out quickly, I’m posting this right away because if I wait until I can find time to dissect it, more of them will likely sell out. Separately they have a clearance sale of three items, headlined by the manufacturer refurbished Canon 5D Mark II (yes, Mark TWO) for $1599 with free shipping. It is in-stock as of the time of writing. This went for $329 last week, but as of this recheck, you can get the manufacturer refurbished Canon M10 with 15-45mm for $279 with free shipping and a 1-year Canon USA warranty from the official Canon USA Outlet store. Of interest if interested in a “take pictures with” kit for the Canon mirrorless system. Both the black and the white color schemes are in-stock as of the time of writing. UPDATE: another model has dropped since last week, the refurbished Canon M3 with 18-55 has dropped from $399 to $349. Both the black and the white color schemes are in-stock as of the time of writing. 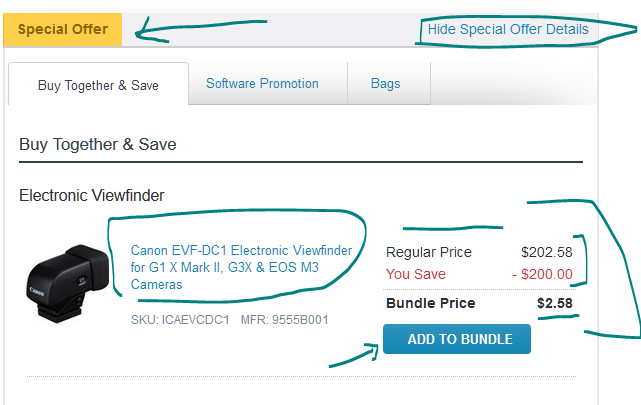 The official Canon USA store, in NEW condition this time, is offering a Canon M6 combined purchase discount, if you buy one of the Canon M6 kits (four options, body, with 15-45, Video Kit, two lens kit) AND the Canon EVF-DC1 electronic viewfinder, together in the same shopping cart, you pay only $100 more for the EVF-DC1. These are new condition! You can find this offer at some authorized dealers, for example, at Adorama, expand the yellow “Special Offer” section and you’ll see the option. If you already have Canon mirrorless system lenses, or you are planning to use the lens mount adapter, or don’t want/need the “with 15-45mm” kits, another Canon mirrorless camera on the way out is the M3. The body remains available with some free accessories for $429 at Adorama, same price as mid early November when we posted the Mirrorless Price Charts. But if you want to shave $100 off that price, and still get a 1-year warranty from Canon, you can get it for $329 in manufacturer refurbished condition (manurefurb) where it is one of the 38 cameras in their refurbished iLC sale. UPDATE: but if you want a “take pictures with” kit, you can get it in either black or white for $399 with a 1-year warranty in manufacturer refurbished condition. Both colors are in-stock as of the time of writing. Another sale promotion featuring 38 refurbished Canon DSLRs and MiLCs is now in-progress at the official Canon USA outlet store, offering 1-year warranties on their manufacturer refurbished products as usual. If you are curious about the Canon mirrorless system, but don’t want to break the bank, one of these offers, in-stock as of the time of writing, is the manurefurb (new proposed LOL term for “manufacturer + refurbished”) Canon M10 with 15-45mm in the black or the white color scheme for $329. This is an older model on its way out (no longer available at Adorama or B&H), but you can get it in new condition for $450 by Samy’s Camera thru Amazon. This was already off the radar when we posted the Mirrorless Price Chart in early November 2017. The Canon M6 dropped $100 since we posted the Mirrorless Price Charts, currently going for $680 body only and $800 with 15-45 at authorized dealers such as Amazon and Adorama. But the official Canon USA outlet store has two optional combined purchase discounts on the new condition Canon M6 kits (not the refurbished). Thanks to a combined purchase discount, you can get either the EVF-DC1 for $50 more or the Mount Adapter (EF/S lenses to EF-M bodies) for $50 more. I don’t know if you can get both discounts if you add them all to your shopping cart. And now to the Canon mirrorless system we go. The new condition Canon M100 with 15-45mm goes for $500 with some free accessories at authorized dealers such as Adorama. This offer is mentioned on the product pages of both eligible cameras and the Mount Adapter. The price math is this: $500 + $200 – $150 = $550 total. Three of the four refurbished Olympus refills of yesterday continue (the E-M10 II and silver Pen-F) to be in-stock as of the time of writing, and so do many of the Canon Pumpkin Spice Sales. A couple of them are “take pictures with” kits if you want to try out the Canon Mirrorless system without spending too much money on it. Both the M3 and M10 mirrorless cameras are starting to fade out in new condition from authorized dealers (eg a number of kits are gone from B&H and Adorama). In new condition, this kit goes for $450 at Adorama without the two free BG-E3 grips. So mayhaps the grips are the deciding factor? In new condition, this kit is not available at B&H and Adorama, but you can get the M3 body only with the usual freebies (NOT the EVF-DC1 EVF) for $429 at Adorama. The EVF-DC1 is a more expensive freebie, it goes for around $200 on its own, and it’s more versatile, you can also use it with the G3 X and G1 X II rawsumers, which by the way are also on sale as part of the Pumpkin Sale. The Canon M5 body only mirrorless camera goes for $929 at authorized dealers, some of which are offering free accessories with it, such as Adorama. Or it can participate in the Pixma AMEX MIR promotions, such as B&H Photo where you can get the M5 body only along with the Pixma PRO 100 printer and its trusty SG-201 sidekick (50pk 13×19 inch photo paper) for $959 after a $350 mail-in rebate (prepaid AMEX gift card). Or if you just want the Canon M5 body only kit, without freebies or printers, you can get it in manufacturer refurbished condition for $750 with free shipping and a 1-year warranty from the official Canon USA store. Canon is back with their renewed interest in their mirrorless system. They have a new camera, the M100, that will be available in two options. For $600, with the 15-45mm kit lens, and for $950 with the 15-45 and the 55-200 lenses. They are available in black or white and pre-ordering is available at B&H Photo and Aamzon itself and Adorama. With this announcement, mirrorless cameras “scored an equalizer”, making the score 8 vs 8 in DSLR vs Mirrorless among the New Cameras of 2017. LIVE NOW and FREE to Watch during this promotional period at CreativeLIVE is a Fast Start class on the Canon M5 and M6 by John Greengo. You may need a Flash enabled browser if you are not seeing video on a browser without or if you have turned off video-playback and such in your browser. If you want to use Canon EF or EF-S lenses on Canon EOS M mirrorless cameras, the Fotodiox Pro Lens Mount Auto Adapter is on sale for $40 with free shipping at Amazon by Amazon itself. Limit up to ten units per customer. It averages 4.5 out of 5 based on 110+ customer reviews and has 35mm questions answered (sorry, I couldn’t resist!). This is an old fashioned sale, not a Lightning Deal, so the exact expiration date is unknown as Amazon price bots change prices based on a variety of factors. More Rokinon action at Adorama, with two variations of the 12mm f2 manual focus lens on sale for $289 each along with $6~ promotional rewards and free shipping at Adorama until 5/7/17. The Rokinon 12mm f/2.0 NCS CS Manual Focus is offered in four mirrorless systems: Fuji X, Micro Four Thirds, Sony E, and Canon M.
Meanwhile the Rokinon 12mm F/2.0 Ultra Wide manual focus lens is offered in Fuji X, Micro Four Thirds and Sony E.
Both the 15-45mm and 18-150mm lenses are f3.5-6.3 IS STM. It is not a typo 🙂 Also part of this new product group is the Canon EVF-DC2 Electronic Viewfinder available for pre-ordering in either silver or black (sorry, no Raiders edition) for $249. This camera has been added to the New Cameras of 2017 page, making this the fifth mirrorless camera to be announced this year (along with the Panasonic GH5 and GX850 and the Fuji X-T20 and GFX 50S). And now some mirrorless action at the Canon USA webstore, you can get the manufacturer refurbished with 1-year warranty Canon M3 with EF-M 18-55 IS STM along with a FREE refurbished EF lenses to EOS-M cameras mount adapter, all together for $350 in the black color scheme. UPDATE: if you don’t need the 18-55 lens, the refurbished M3 body only also gets the free mount adapter, for $300 with a 1-year warranty. PS: the free mount adapter promotion expires 12/31/16 or earlier if they run out. Coming along for the Canon EF-M system is a new superzoom lens, the EF-M 18-150mm f3.5-6.3 IS STM, available in either black or silver, with a pre-order price of $500 at Adorama and B&H Photo. Canon has launched official Video Creator Kits for the Canon 80D w/18-135mm kit and the Canon M3 w/18-55 kit. They are available for pre-order at B&H Photo for $2050 and $900 respectively. If you are curious about the Canon Mirrorless system, there’s a practical bundle available at Adorama. They offer the Canon M3 with the 18-55mm lens and EF-EOS M lens mount adapter for $599 with free expedited shipping. But you are not done yet. Expand the yellow “Special Offer” segment. The first option there is to add the Canon EVF-DC1 Electronic Viewfinder (for G1 X Mark II, G3X & EOS M3 Cameras) for just $2.58 more. Just press the blue “Add to Bundle” button and then below it the green “Add Bundle to Cart” and proceed as usual. Canon is rolling out a brand new lens for their Mirrorless System (yes, they have one), the Canon 28mm f3.5 Macro IS STM EF-M is available for pre-order for $299 with free shipping with a late June 2016 release estimate at Adorama and B&H Photo and Amazon itself. This too has been added to the New Cameras and Lenses of 2016 tracking page. B&H Photo is offering 10% promotional rewards on select lenses. We start with a prime for the Canon EF-M mirrorless system, the 22m f2 STM EF-M lens goes for the authorized dealer price of $250, but B&H Photo also includes 10% promotional rewards with it (= $25~) which can be used on future purchases at B&H. Bright prime time for mirrorless shooters, the Handevision 40mm f0.85 lens is on sale for a limited time for $800 with free expedited shipping at B&H Photo in the Fuji X, Micro Four Thirds, Sony E-mount, and Canon EF-M mirrorless.